There are really only 2 reasons why you need ground fault circuit interrupters, or GFCIs, but they're both very, very good reasons. First of all, it's the law. Most local building codes require GFCI protection on receptacles (outlets) and some other devices in wet areas, work areas and outdoors (more on that later). The second reason is that GFCIs help protect against dangerous electrical shock, including electrocution. Just to be clear on terminology, electrocution is a shock, and it's the last one you'll ever get, at least in this lifetime. Ground fault circuit interrupters do exactly what their name implies; they interrupt a circuit experiencing a ground fault. A ground fault is a potentially dangerous (but not uncommon) situation in which electrical current follows an unintended path. Let's look at the classic example of a dimwitted (or seriously time-crunched) person using a hair dryer in a bathtub. One ugly possibility is that the user drops the dryer into the water. Another is that the dryer malfunctions and develops a short (say, a wire comes loose inside), allowing electricity to pass through the dryer's handle and into the user's hand. Since the hand is connected to the body and the body is sitting in water, the body creates a relatively convenient path for the electricity to get to the water (electricity likes water because it's a pretty good conductor, providing easy travel). Along the way, the electrical current can stop the body's heart. Now, if the dryer is plugged into a GFCI outlet, the outlet will sense a leak, or imbalance, in the current and trip its own internal breaker, cutting the power and stopping the shock short. Even if you're not careless enough to use a hair dryer while bathing, you could easily create a ground path for a fault by holding the dryer in one hand and touching the metal on a sink faucet. The faucet may be connected to metal water pipes, which are likely to be grounded, thus creating an attractive avenue for the electrical current. In other words, you don’t have to be dimwitted or even extremely late to put yourself at risk. And that's why you need ground fault circuit interrupters in the bathroom, among other places. Now that you've answered the question "Why do I need ground fault circuit interrupters?" the next question to ask is "Where do I need ground fault circuit interrupters?" The most detailed answer lies with your local building department, which has the final word on electrical system requirements for homes in your area. But most codes follow the same standard, the National Electrical Code book, or NEC. Typically you need GFCI protection on all receptacles in bathrooms, on easily accessible outlets in garages and basements, and on most outdoor outlets. In the kitchen, GFCI protection is required on all outlets serving the countertop areas (including all of your backsplash receptacles) and any outlets within 4 feet of a sink. You also need GFCIs within 6 feet of other sinks, such as those in laundry rooms or wet bars. GFCI protection comes in a few different forms. Perhaps the most common is the GFCI receptacle, the one with the flat face and the little red and black buttons between the two sets of plug slots. A GFCI receptacle can be wired to provide protection at the receptacle alone or to protect itself and other receptacles and devices "downstream" along the same circuit. It can't protect devices upstream; that is, between the power source (breaker box) and the receptacle. Another option is to install a GFCI breaker, which provides ground-fault protection for everything wired to the circuit. When you're working outdoors and are plugging into a non-GFCI outlet, a GFCI extension cord gives you the (highly recommended) protection. Why Do I Need a Ground with Ground Fault Circuit Interrupters? GFCI protection is not the same thing as grounding. You don't need a grounded circuit for a GFCI to do its primary job, but a GFCI installed on a non-grounded circuit does not provide a true ground, or equipment ground. 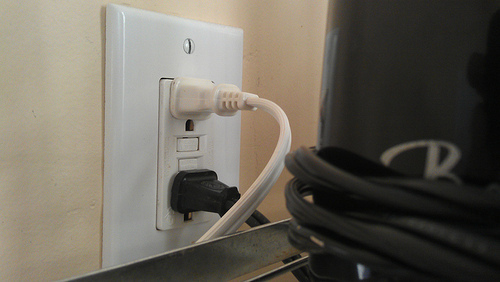 In short, this means that surge protectors and other devices that require a ground may not do their jobs. Any receptacle or device that's wired for GFCI protection on an ungrounded circuit should carry a visible label indicating "no equipment ground." These labels often come as little stickers included with new GFCI receptacles. If you install a GFCI to protect standard receptacles downstream of the GFCI, each of those outlets also needs a label, since none of them is grounded. Find a licensed electrician in your area to install GFCIs for you.